crude Archives - Kase and Company, Inc.
Brent crude’s failure to close above the $57.5 completion point of the weekly morning star setup (circled in green) was negative and indicates the geopolitically driven move up that took place last week may be short lived. The Brent crude price rose modestly on Monday, but most short-term technical factors indicate it should test $53.1 again. A close below this would call for $49.2, which is the last target protecting the $48.95 contract low. Look for resistance at $57.5 and $60.05. A close over the latter would open the way for the $63.66 swing high to be challenged. 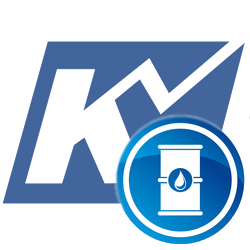 Take a trial of Kase’s weekly WTI and Brent Crude Oil Price Forecast. Most technical factors now indicate that WTI’s upward correction has failed and that the near term WTI price outlook is negative again. Monday’s decline broke the lower trend line of a bullish ascending wedge. Formations like this break higher around 75 percent of the time, so failures like this do not generally bode well for a continued price rise. More importantly, WTI prices are about to take out the crucial $48.2 swing low. This level is important because it is the 1.00 projection for the wave $55.05 – 48.2 – 54.92, the 62 percent retracement from $44.37 to $55.05, and the key swing low for the upward wave formation from $44.37. Taking out $48.2 would call for at least $45.5, and very likely to $43.8 and lower. 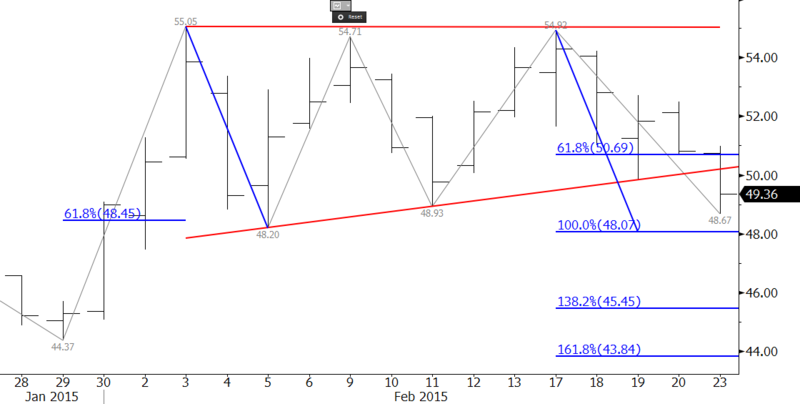 The only real hope for a continued WTI price rally in the near term would be for prices to hold $48.2. Look for resistance at $51.0 and $52.5. A close over $52.5 would call for another test of the triple top of $55.0. 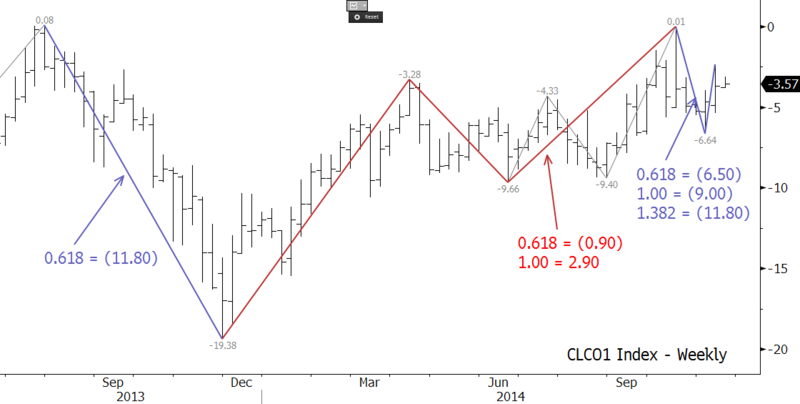 For a more in-depth analysis, take a free trial of Kase’s weekly crude oil price forecast. Coming into this week there was an outside chance that Brent would hold $67.0. However, prices settled below $67.0 on Monday. There is immediate support at $65.2 as discussed in this week’s Crude Oil Commentary, but the decline is now poised for at least $62.8 and likely $58.5 before a measurable retracement takes place. The key target is $58.5 because it is the most confluent wave projection and the equal to (1.00) target for the wave $112.59 – 83.41 – 88.42. A sustained close below this will open the way for $53.8 and $48.7. There is very little evidence that the move down is going to end at this time. Prices are still deeply oversold and overdue for a correction, but until at least initial resistance at $70.5 is overcome, the move down is favored. Next resistance is $72.1, and a close over the this would call for and an extended correction to $75.1 and possibly $79.8. 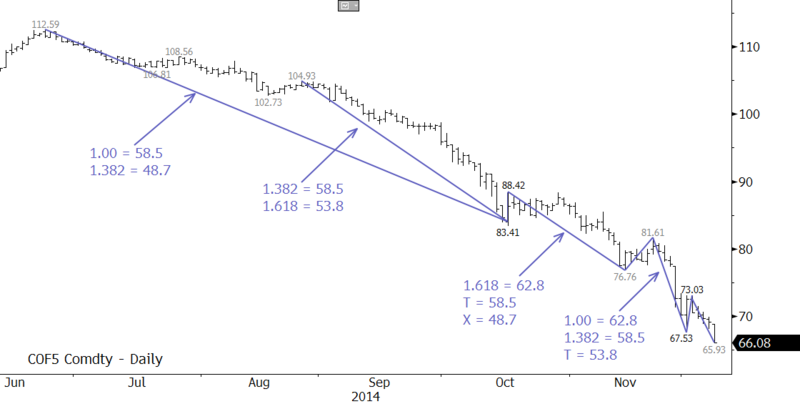 For detailed weekly forecasts take a trial of our energy commentaries. The WTI-Brent spread narrowed last week, but the move looks corrective. The spread will likely oscillate for the near-term, but ultimately odds favor a widening spread. The first target is (5.00), and a close below this would call for (6.50) and (9.00). 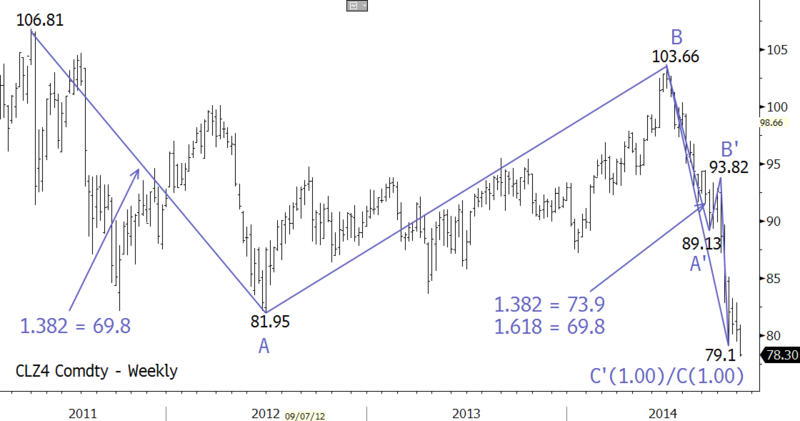 Key long-term support is (11.80). This is a confluent wave projection and the 62 percent retracement from (19.38) to (0.01). 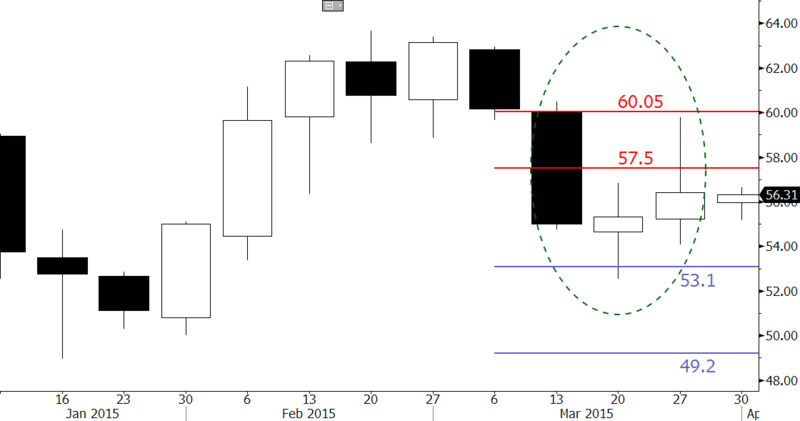 Resistance at (0.90) should hold. 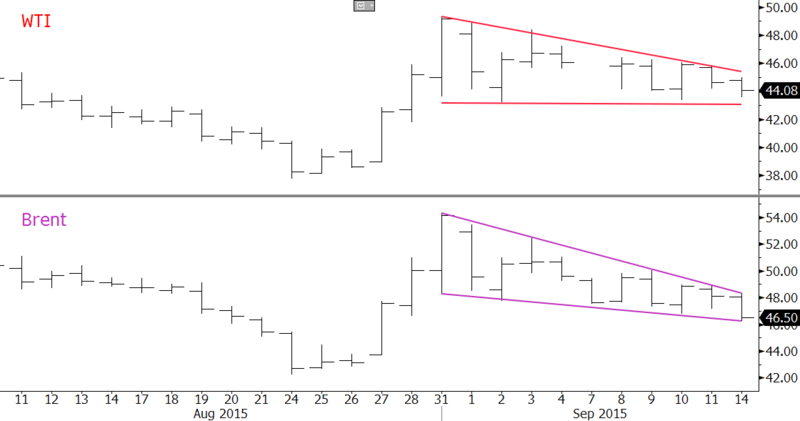 A sustained close over (0.90) would open the way for 1.30 and 2.90. For more information and to take a trial of Kase’s weekly energy forecasts please visit the Energy Price Forecasts page.